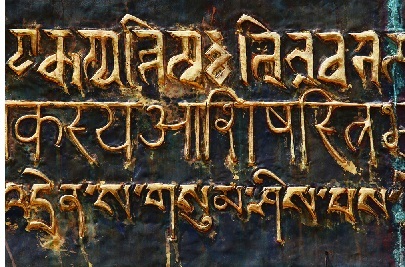 Ancient Sanskrit - India is a land of many languages. Too many to try and list them all here. But amongst the oldest and most significant is Sanskrit, an Indo-Aryan language. The oldest form is called Vedic Sanskrit because the Vedas, the oldest Hindu scriptures, are written in this language. The geography of India is largely responsible for the wide variety of languages and peoples who speak them. The northern half is only accessible from the northwest through the Khyber Pass. It is through this pass that the early Indo-Aryans migrated and settled in the Indus Valley. The middle of the subcontinent is divided by the Vindhya Mountains, a range that averages about 3000 feet (914 m) in elevation. In ancient times these mountains were covered by thick jungle, making them virtually impenetrable. So for several centuries the people of the northern subcontinent would have had almost no contact with the people south of the Vindhya Mountains, the region known as the Deccan Plateau. The inhabitants of the Deccan Plateau spoke languages from a family known as Dravidian languages.